In May 1873 Januarius MacGahan, a correspondant of the New York Herald, set out down the Jan'a Darya with his Karakalpak guide, aiming to rendevous with the Russian army led by General Kaufmann, which was advancing down the Amu Darya towards Khiva. Not long after leaving Fort Perovsk, MacGahan encountered a small Karakalpak awıl undertaking its spring migration. These Karakalpaks were relatively well-off compared to their brethren living in the Aral Delta, and had adopted a Qazaq lifestyle, spending from early spring until late autumn migrating with their cattle and sheep, their yurts conveyed by camel rather than cart. 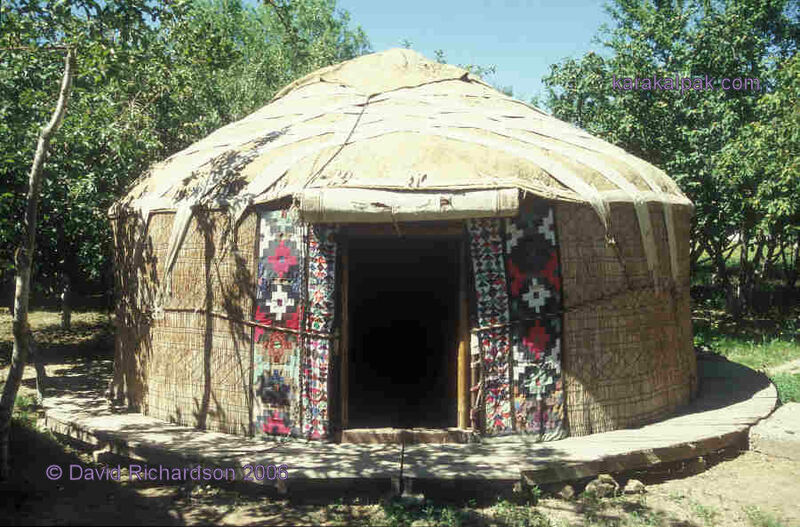 MacGahan became the first Westerner to describe the erection of a Karakalpak yurt. "The work of breaking up camp, taking down the kibitkas, and packing them with the household goods on the backs of the camels, and driving forward the flocks and herds, devolves upon the women and boys; the men in the meantime mount their horses and ride forward to find a place for the next encampment. The men we now spoke to had chosen this spot on account of a pond, or puddle rather, of muddy water in the viscinity, and the grass, which was reasonably good for the desert. The aul soon arrived; the camels with the women and children came trooping in a long line, followed by the flocks of sheep and of cattle, which immediately scattered themselves over the plain in search of pasture; the camels were made to kneel by a jerk of the cord around the muzzle or through the nostrils, in guise of bridle; the women descended and immediately commenced setting up the kibitkas and unpacking the household goods, in which task they were little helped by the men; fires were lit, kettles put on, and everything was bustle, life, and animation. As soon as the camel carrying the felt and framework of a kibitka arrived, he was made to kneel down, two women seized the framework, set it up on end, and stretched it out in the form of a circle, one holding it while the other fastened the different parts together. Then the doorposts were set up, and a camel's-hair rope drawn around the whole to bind it tightly together. One of them took the wooden hoop, which serves as roof-tree, and elevated it inside the tent by means of a stick inserted into one of the many holes with which it is perforated, while the other immediately commenced inserting the rafters, some twenty or thirty in number, the bases of which are fastened to the lower framework by means of loops. The heavy rolls of felt are then drawn over this skeleton, and the kibitka is complete. It is about fifteen feet in diameter and eight feet high, and in shape not unlike an old-fashioned straw beehive. The whole operation only requires about ten minutes, and it is so solid that any wind short of a tornado will not budge it." We have so far failed to find any photographs illustrating the Karakalpak summer migration. The Savitsky Museum photo archive contains several images annotated as "nomads", clearly undertaking their seasonal migration. There is no information indicating the ethnic group involved, the geographical location, or the date. 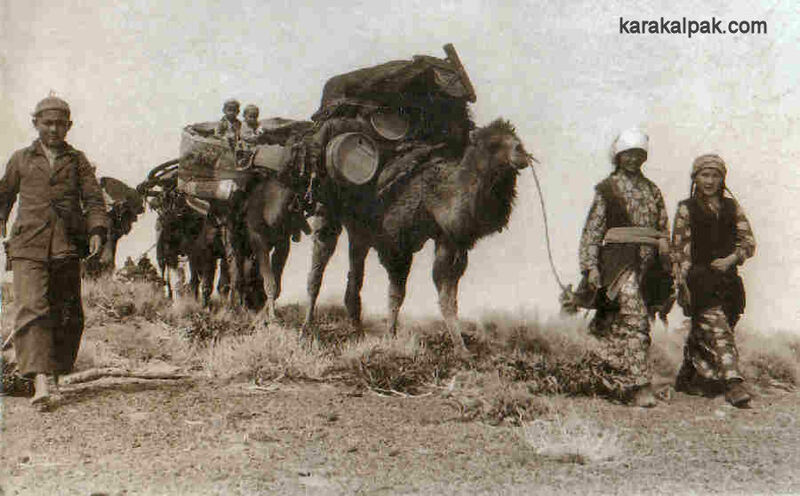 The images look like Qazaq women and children transporting their yurts on camels. Their costume dates to the 1930s or early 1940s. In 1975 the Scientific Cinema Group of the Institute of Ethnography (Moscow) and the Ethnography Section of the Academy of Science (No'kis) made a film showing the assembly of a Karakalpak yurt. The film was made in Qazaqdarya where at that time there were about 500 households (mixed Karakalpak and Qazaq population). In each of these households there was a yurt. 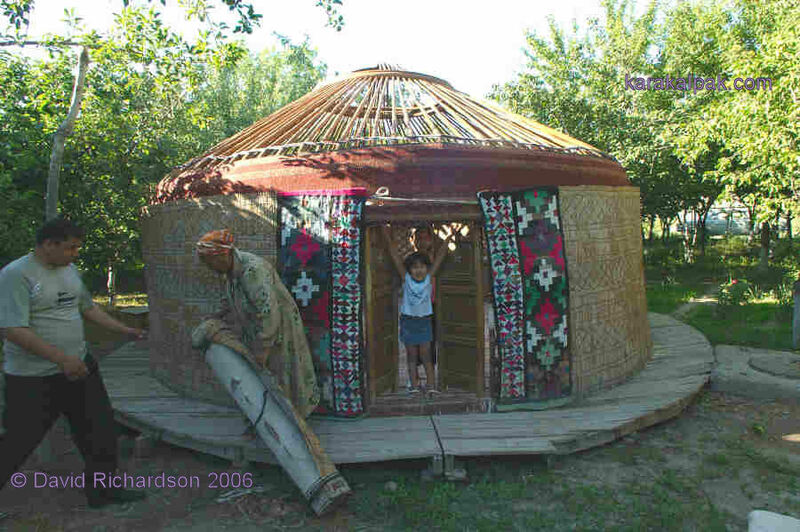 When we first visited Qazaqdarya in 2002 we were told that virtually all of the houses still had a yurt. This film is described in detail in Karakalpak Ethnography by Xojamet Esbergenov and V. A. Oskin. The yurt erected in this instance had a complete set of all of the traditional tent bands and decorations. Most of the yurts that we see today do not have the complete set. The place where the yurt is erected is known as the jurt. As many yurts are now used in addition to the family tam or house there is no longer the need for a hearth inside. This means that the yurt is now often placed on a raised circular platform made from wooden planks instead of on a surface of packed clay. According to Esbergenov the yurt was traditionally orientated with its entrance towards the south. This was apparently so that the to'r (the place of honour inside the yurt opposite the entrance) would be on the fresher northern side. The prevailing wind in the lower Amu Darya is from the north. The yurt is also sometimes placed in the shadow of the house instead. We frequently see yurts placed under trees or next to a stream to preserve their coolness. 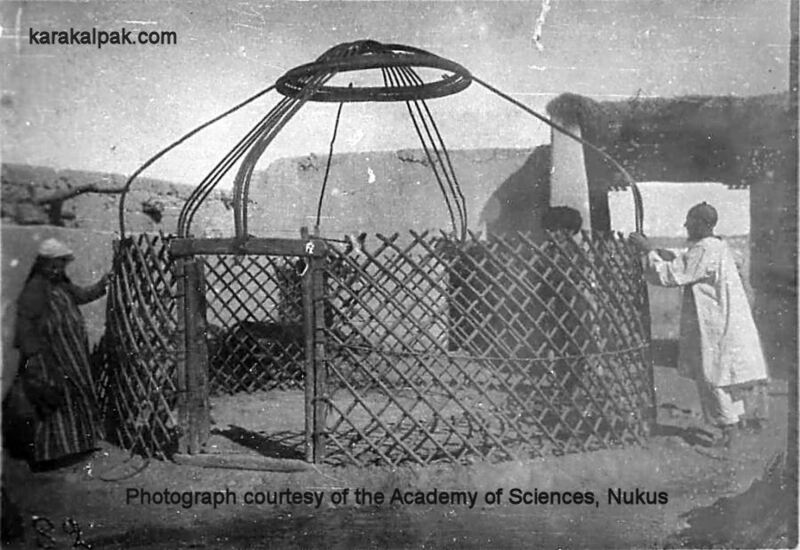 The frame of a small Karakalpak yurt photographed by Melkov in 1929. Compare how the roof has been fitted with the notes given below. Yurts were traditionally assembled by women, presumably because they used to accompany the livestock to the summer pastures while the men worked in the fields. In the past families erected the yurt themselves, generally under the guidance of an older experienced woman. Now many families rely on the knowledge of these women to erect their yurts. We have visited villages where the families were waiting for the expert to become available so that they could put up their yurt. Yurts were traditionally erected on an auspicious day such as a Wednesday, but this no longer seems to be so important. Now they are erected when the family which owns the yurt and the forewoman who is the expert in the erection process have time available. Today most families who possess a yurt erect it only during the summer months or, if they do keep it erected all year, then it is kept under a permanent roof, protecting the felts from rain and snow. We have seen two instances of yurts kept under a permanent cover. Yurts are generally erected in late May or early June, after the rains are over, and dismantled in October or November. 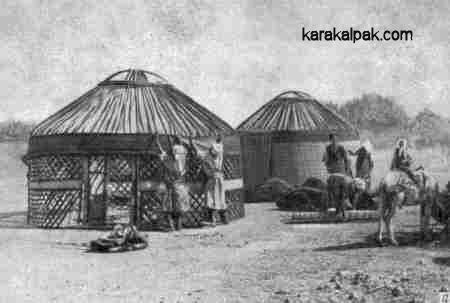 Erection of a pair of Karakalpak yurts, photographed at some time prior to 1960. Adjustments are being made to the qızıl basqur on the yurt in the foreground. 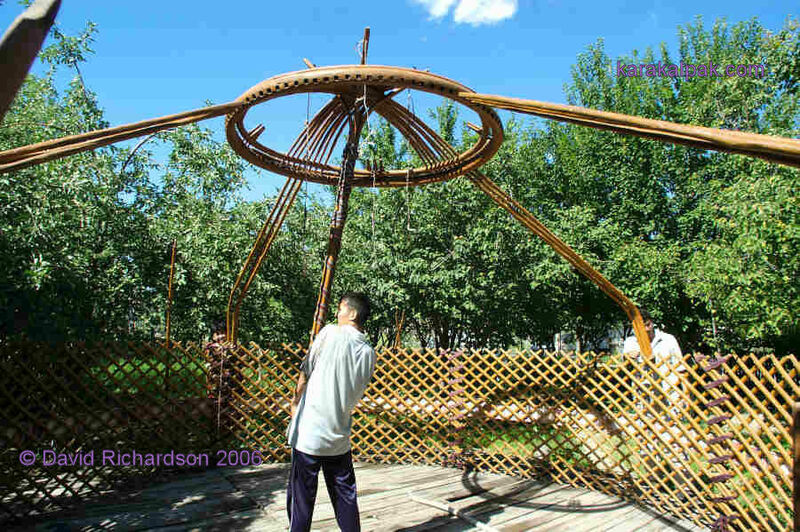 In 2004 we were privileged to be invited to watch the erection of a yurt belonging to a family in one of the suburbs of No'kis. This yurt was made in 1981 in Shımbay as were the shiy screens and esik (reed door). The forewoman was Ulbiyke Qayıpnazarova from Taqıyatas. All of the family were lending a hand and a festive atmosphere prevailed. The yurt was to be erected on a wooden base, about 6 to 7 meters in diameter, raised about 25 centimetres above the ground. It was situated in a shady part of the garden next to the house. Ulbiyke began by taking the first qanat (lattice section) which had been held in a closed position with coloured tape � dizbe. It had a slight bend in it. She untied the cords and opened it out. She then joined the first and second qanats together by putting a loop in the end of the dizbe over the top sticks then interlacing it down the vertical edge of each qanat. This was put on loosely at first and then progressively tightened. Joining the qanats to make the kerege. Each qanat was numbered so that they could be assembled in the correct order. As she linked the sections together she constantly made adjustments to their height and width. When joined together to form a circle the qanats become known as the kerege. When the kerege had been adjusted to the right size, she set the threshold (bosag'a) of the door in a special hole in the wooden yurt base and levelled it with bits of stone and sticks. In "Karakalpak Ethnography" Dr Esbergenov states that the installation of the yurt began with the door. The door and all of its constituent parts is called the ergenek. This name is also used specifically for the two wooden door leafs which fold inwards. The lintel is known as the man'laysha, from the word man'lay � forehead. The side struts are called tulg'a, and the threshold is the bosag'a. According to Dr Esbergenov, after the door is assembled the qanats are joined to it. Work should always proceed from right to left (as viewed from the to'r inside the yurt). This process is known as "on' jaq" which literally means right side. Ulbiyke did not follow this procedure and we are unable to say whether or not strict rules are still largely adhered to. 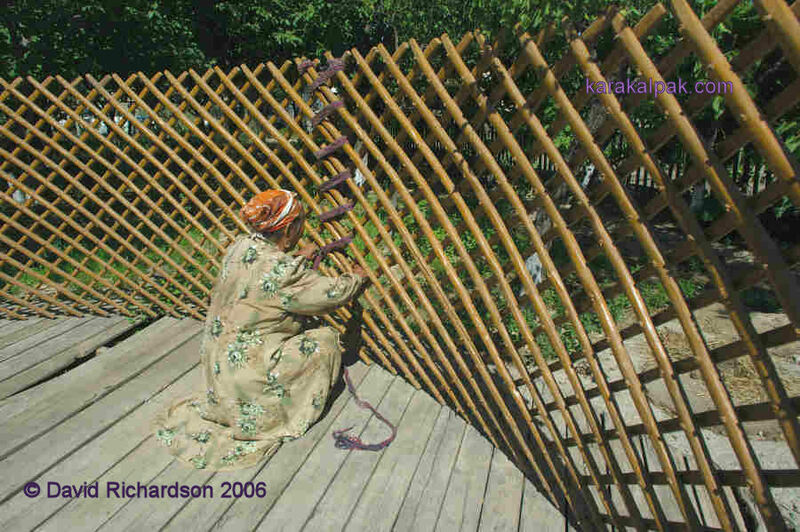 Most of the rest of the installation of this yurt did follow the procedure mentioned by Esbergenov. After levelling the bosag'a she inserted the right hand door leaf (as viewed from the outside) into its slot, and then the left hand leaf. Next came the right hand door jamb (tulg'a) followed by the left one. Then the horizontal lintel (man'laysha) was slotted on top. She then tied the final qanat to the tulg'a on the right hand side, followed by the left and tightened it. Fitting the door to the kerege. The ishki beldew (inner waist belt) with its pattern facing inward is put through the gap between the right hand door leaf and the tulg'a and run around the outside of the yurt halfway up the qanats. The end goes through the gap between the left hand door leaf and the other tulg'a and is turned back on itself by one metre. The ends of the fringe are used to tie it to the kerege. This adds structural stability to the circular trellis wall. 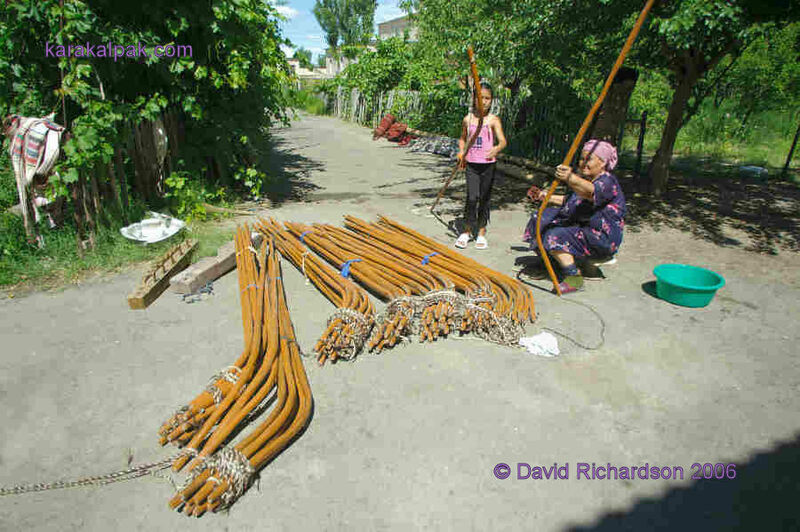 While this was happening the rest of the family, including the children, unpacked and washed bundles of roof struts (uwıqs). Each had a hole at the qanat end with a cord running through it, the cord having black and white stripes with the appearance of a barber's pole. The black ply was goat hair and the white ply was sheep's wool. The next stage was the lifting of the roof-wheel (shan'araq). This is the most difficult stage of the assembly since the shan'araq is very heavy and unwieldy. Ulbiyke began by selecting four uwıqs of similar shape and tying them together to form a lifting pole that looked a little like a hat stand. The shan'araq was placed on the wooden base in the centre. It had to be aligned in a certain way (with the crosspiece orientated to the cardinal points according to Esbergenov). The front part is 3 centimetres longer than the back part. The shan'araq was lifted with the pole made of uwıqs. The women stood outside of the kerege trying to fit uwıqs into the shan'araq but they found this difficult to achieve. They therefore rested the shan'araq on top of the door so that it was stable and reachable and then fitted some of the uwıqs in to the holes (ko'z) in the external rim (taban). Three uwıqs were fitted into three adjacent holes in the shan'araq and this was repeated in each of the other three quadrants of the shan'araq. With four people, each holding their bundle of three uwıqs tied together, the shan'araq was lifted with the pole. The forewoman roughly tied her bundle above the centre of the door then ran around to check that each of the other bundles was positioned correctly. Lifting the shan'araq with four bundles of uwıqs in position. Now the process of tying the uwıqs to the door and the kerege could begin. Firstly two further uwıqs were fitted into the shan'araq at positions which corresponded to each side of the door frame. They were tied on to the top of the door jambs which protruded through the man'laysha. Then the three uwıqs that had been tied together and positioned above the door were separated and tied to carved wooden posts on top of the man'laysha. Now each of the bundles of three uwıqs are separated and each individual uwıq is tied to its corresponding kerege head, or keregebas as it is known. 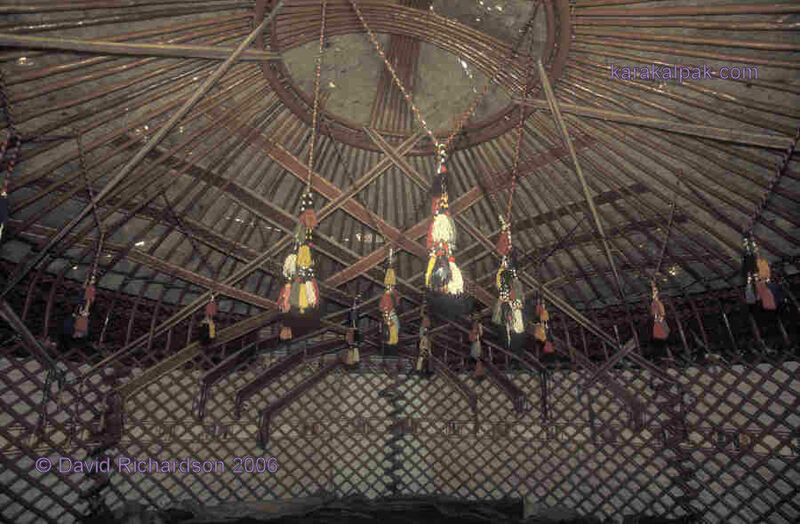 Finally each of the remaining uwıqs are fitted into the shan'araq and are tied to the kerege. The laces attached to the end of the uwıqs which are used to tie them to the kerege are called uwıqbaw. The sharpened upper end of the uwıq which fits into the shan'araq is called qa'lemshe (qa'lem meaning a pencil). The bend of the uwıq which gives the yurt roof its distinctive form is known as the iyinew (iyin, shoulder). The method which we witnessed was very similar to that described by Esbergenov. However he also mentions a second method, which he was unable to film, where the shan'araq can in theory be raised and attached by two people. This entails the use of a long post (2½ to 3 metres long) with a forked end, known as a baqan. Standing in the centre of the kerege circle, the expert would balance the shan'araq very accurately on the fork of the baqan which rested on the ground. The assistant would then install the uwıqs. This is obviously what Ulbiyke was attempting to achieve but the weight of the shan'araq was just too heavy to do this. Next the qızıl basqur or red main band was unrolled. It was positioned with the pattern facing to the inside of the yurt, at a height where the bottom edge of the basqur aligned with the joint separating the keregebas and the bottom of the uwıqs. The upper edge of the basqur reached above the bend (iyin) of the uwıqs. As it was tightened it compressed and constrained the whole structure. This qızıl basqur was a particularly fine example and was wider than usual � perhaps because they had no aq basqur to go above it. It is now rare to find a yurt with both an aq basqur and a qızıl basqur. Most only have the qızıl basqur and in some cases even this has been replaced by a completely different tent band. In one example that we saw the yurt owners had used a completely untraditional blue basqur. Tying the dizbe following the installation of the qızıl basqur. 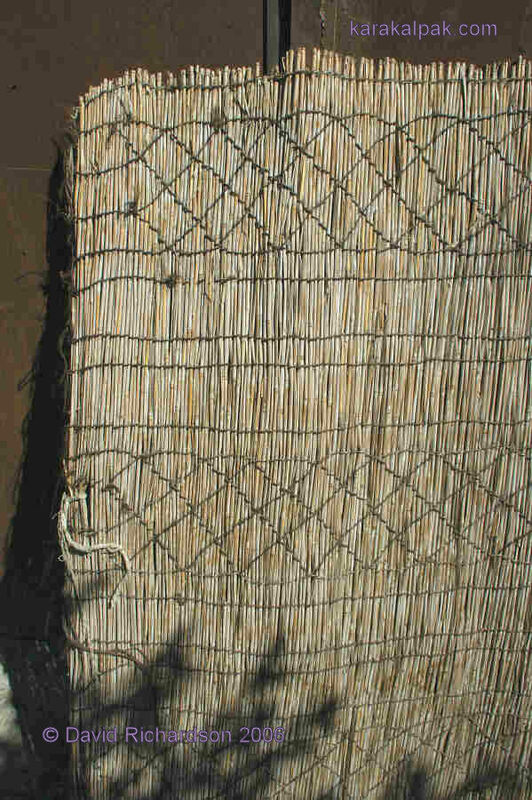 Narrow braid known as dizbe is then used to separate the uwıqs uniformly to even the tension and strengthen the structure. As this is done the uwıqs start to shift about and need a lot of adjustment. 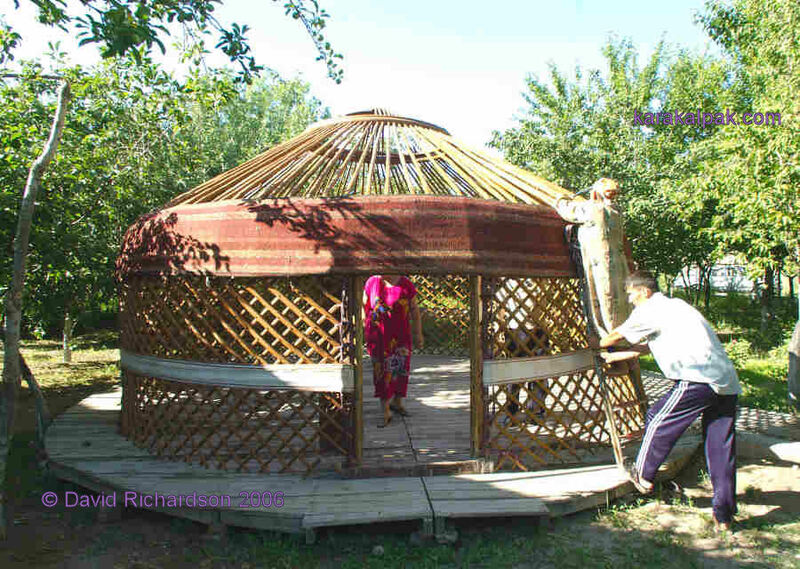 The forewoman went up rickety steps on the outside of the yurt structure to fix the dizbe � roughly at first and then tightened it. Apparently she did not have to start in a particular place. At this point our experience differed from that described by Esbergenov. He says that the next stage is the installation of a set of decorative woollen tassels (ayaqbaw) which hang from the shan'araq of the yurt. For some reason Ulbiyke left this until last. However it would make more sense to do it at this stage as it is presumably easier to do before the roof felts have been added. It may simply have been because it was getting late in the day and she wanted to get on with more of the structural components. Traditionally the next stage would have been the installation of the aq basqur or white main belt. This is one of the crowning glories of Karakalpak weaving. As Esbergenov points out although it is called a "main belt" this does not reflect any structural necessity. Rather it is a reflection of the craftsmanship and skill of the mistress of the yurt. The aq basqur is normally positioned with the pattern facing inward so that the bottom of the aq basqur sits against the top of the qızıl basqur. The band is somewhat smaller than the diameter of the yurt and the ends align with the tulg'as, leaving a gap above the door. Unfortunately our hosts no longer possessed an aq basqur so we were unable to see this stage for ourselves. We have however seen numerous yurts with an aq basqur in exactly this position. If the traditional rules were being followed then the next step would have been the installation of the esikqas and the associated pair of ishki janbaw or inner side tapes, sometimes called the iyinbaw (shoulder tapes). This was a complex decoration positioned above the inside of the yurt entrance. The esikqas, meaning the �brow of the door�, was a small rectangular piled carpet, which was positioned facing inwards, above the qızıl basqur and aligned with the door centre. It therefore sat over the gap between the ends of the aq basqur, thus �completing� the design. The end of each ishki janbaw was sewn to the sides of the esikqas and they were suspended outwards like a garland, their other ends being looped up to be attached to the keregebas. 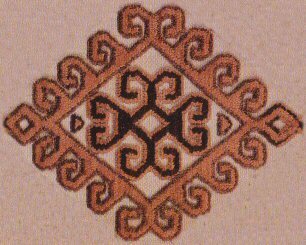 The ishki janbaw were narrow white cotton bands decorated symmetrically in combination technique. They were usually decorated on their lower edges with a fringe of tassels. Our hosts did not have a esikqas and in fact we have only seen one (a modern version) in actual use in all of the many yurts that we have visited. Large panels of decorated felt were then sewn onto the qızıl basqur on the outside of the kerege a short distance from each side of the door. This patterned felt is not traditional. Then thin white cotton was placed around the rest of the outside of the kerege to keep out mosquitoes. In some places we have also recently noticed the introduction of a layer of blue plastic fine gauge mesh, bought on the markets, to fulfil this purpose. Above the cotton lining was a screen made of reeds (the shiy screen), formed from two parts each going from the door to the rear of the yurt. This enabled the screen to be easily rolled back to let in more light and air. In some cases a layer of felt is used and then a layer of shiy. This is probably more traditional, harking back to the times when yurts were used all year round. According to Esbergenov, two layers of shiy screen could be used instead of one of felt and one of shiy. Detail of one of the shiy screens. Next two large vertical sections of appliqué were attached to either side of the door, covering the gap left between the door struts and the felt panels. These are known as the shiy on'ır, or breast of the shiy. In the past they were woven in combination technique with a white cotton base and a raised pile pattern in wool. The patterns were generally pairs of "mu'yiz" or horns and were woven in shades of brown and red. The shiy screens and shiy on'ır are fitted on each side of the door. The screens and shiy on'ır were then held in place by a beljip (waist rope). Another name for this is the sırtqı beldew (outer band). This reflects the fact that sometimes in the past a long white cotton band was used for this purpose. The beljip not only holds the screens in place but is also used to stabilize the yurt in high winds. This was formerly done by attaching short ropes from the beljip to stakes in the ground. Now it is quite common to see these stakes replaced by a heavy car wheel hub instead. Then the esik or reed door is added. This is rolled up above the wooden door or ergenek. It is slightly larger than the door opening to keep the wind out. Traditionally it was decorated along its outer sides and bottom with strips of weaving in combination technique, similar to the shiy on'ır. The vertical strips are known as shiy qayıw and the lower horizontal strip is the suwag'ar, which means gutter. To decorate their esik our hosts had used strips from an old tent band. In the centre of the esik it was customary to sew a duwashıq � a triangle with its apex pointing downwards. This is seen as amuletic and protects the entrance to the yurt. In the past pieces of paper with verses from the Qu'ran were sometimes put into a pocket in the duwashıq, thereby fulfilling a similar role to the ha'ykel neck decoration worn by girls and women. The roof felt is in three parts; a front piece (aldıngı u'zik), rear piece (artqı u'zik), and a rectangular piece which covers the smoke-hole (tu'n'lik). All of the parts are lifted with the aid of the baqan. The front piece is put on first. This has 12-15 centimetre-wide tent bands known as qızıl qur (literally red band, even though they may not all be red) sewn onto it. Three bands on each side of the yurt roof are most common but we have often seen five on each side. Five bands are seen as a sign of wealth. The felt is placed on the roof and the qur hang down through the uwıqs into the interior of the yurt. These are then interlaced and tied to the kerege to form a net or shatırash above and behind the place of honour (the tor). This gives a very festive appearance to the yurt. We have seen several examples of qurs with family names and dates of births or weddings woven onto them. and the shatırash formed by interlacing the qızıl qur. The rear felt is put on next. It is the same shape as the front felt and also has narrow tent bands sewn onto it, again usually three on each side of the yurt roof. These are white cotton and are known as aq qur. They are interlaced on the outside of the felt above the yurt door. The bottom of each band is attached to the beljip. The final decorative element is the sırtqı janbaw or outer side belt. This is a pair of bands in combination technique on a white cotton base. The ornament is similar to the rest of the esik. They generally have a fringe or tassels and are like a larger version of the ishki janbaw. They are attached to the lower corner of the felt and hang as a garland. The other end goes through each tulg'a at the level of the beljip and is attached to the kerege. The final piece to be added is the tu'n'lik. Long ropes go from the corners of the tu'n'lik to the beljip. When they need to open the smoke-hole they untie one of these ropes and push the felt back with the aid of the baqan. Esbergenov, X., and Oskin, V. A., Film about the Karakalpak Yurt, Section 3 of Chapter 2, Ethnography of the Karakalpak (in Russian). From the 19th to the beginning of the 20th century. Information and Research, Published by Fan, Uzbek SSR, Tashkent, 1980. Esbergenov, X., Karakalpak rites and beliefs related to the yurt (in Russian), "Science", pages 179 to 189, Moscow, 2000. This page was first published in June 2006. It was last updated on 6 March 2012.